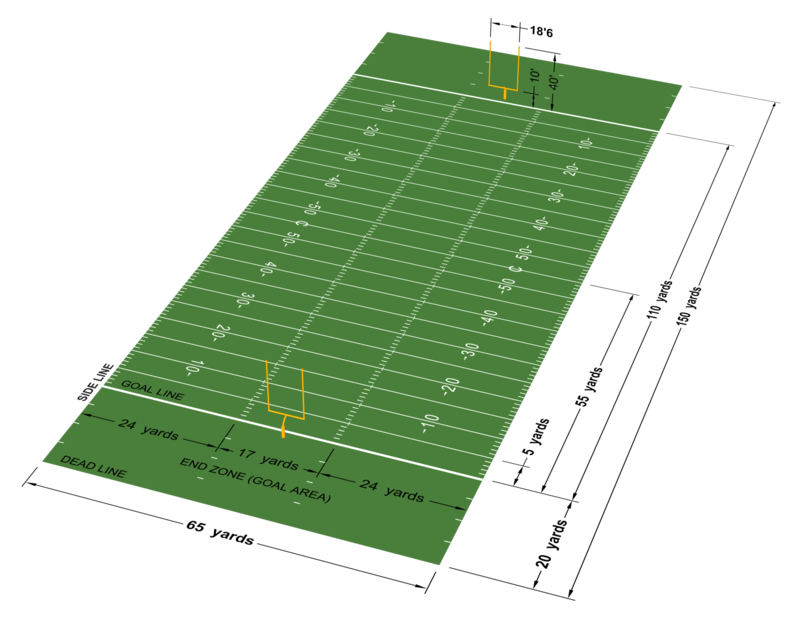 Lots is made of the differences between the CFL and NFL games around the size of the ball, playing with three downs instead of four, single points scored for kicks going out of the endzone, and a larger playing field. One area that often goes overlooked though is starting receiver position on the field. A standard personnel grouping on offence consists of five WRs and one RB, but not all starting receiver positions are the same. Like the NFL, teams are still required to have seven players on the line of scrimmage before the play begins. This generally means the outermost WR on each side of the ball is stationary to begin the play, which leaves the other three WR or slotbacks (SB) free to be in motion or waggle in the backfield and towards the line of scrimmage pre-snap. When looking at pre-game CFL depth charts, the field WR will be the one with 2 SB between them and the QB. Given that the field is 65 yards wide, and the hash marks are 24 yards from the sideline with 17 yards between them, it leaves the narrow side (boundary) WR about 20 yards from the ball to start the play while the wide side (field) WR is nearly 35 yards away from the ball. To get the ball to the field WR, even for a quick bubble screen, is a pass of about 35-40 yards on a 3-5 step drop! It’s certainly possible for professional quarterbacks to make that throw, but given the choice between having to throw 50 yards for a 10 yard gain versus 30 yards for the same gain on the boundary side, it’s obvious which play a QB and offensive coordinator will lean towards. As week one showed, field WRs can produce fantasy points, but historically speaking, it’s not all that common. If you extrapolate stats from these averages, you are generally looking at a receiver with 2 receptions for 24.4 yards and a touchdown once every 9 games or so. That’s not likely to show up in your optimal lineup on a regular basis. There are exceptions to the rule like Tori Gurley who saw significant usage while still in Toronto before he was cut mid-season. However, you can see a clear type of player that winds up at field WR. It’s generally a position filled by a Canadian (National) receiver to account for part of the National ratio requirements, being used more as a blocker and decoy than a primary receiving target. It’s not impossible for a field WR to have a productive game, as we saw in week one. There are ways to get them the ball. Saskatchewan ran Nic Demski in numerous crossing routes underneath coverage, in an attempt to get the ball in his hands, to let him use his speed to create yards after the catch. However, catching 100% of his targets is not sustainable. If he had caught a normal percentage for him – around 61% – his numbers would have looked much more pedestrian with 4 receptions for 53 yards and a meager 9.3 DK points. Duke Williams is an exceptionally talented player that wound up in the CFL in the hopes of resuscitating his career after character issues kept him out of the NFL. Simply looking at the game history tab in his DK profile will show you he had 4 receptions for 110 yards and a TD which looks exceptional for his price tag. What it doesn’t show you is that he was, like Demski, unsustainably efficient, and most of his catches were on the merits of unbelievable athleticism on desperate throws rather than well crafted plays designed to get him the ball. It wouldn’t be at all surprising to see him move to the boundary WR position at some point this season to increase his role in the offence, but for the time being it’s unlikely he can keep up this production from his current position. Jeff Fuller’s week 1 production was marked by similar unsustainable efficiency, but of a different sort. He only hauled in half of his 6 targets, but managed to turn them into 104 receiving yards – an average of 34.7 yards per catch. Fuller is a high ceiling player who’s career has been marred by injury to this point. He could be a great player in Toronto paired with S.J. Green, Ricky Ray, and coach Marc Trestman, but even with that going for him, it’s impossible to believe he’ll average 34.7 yards per reception when his career average is 13.8. Looking at this day through the lens of statistical regression, 6 targets would generally net Fuller 3 or 4 receptions for 41-55 yards. That’s still an okay day with 7-9 DK points at a $3500 price tag, but it’s nothing special. The lesson of the day is that starting receiver placement on the field is vital to projecting production on a weekly basis. Taking a close look at the depth charts CFL teams release 24 hours before game time each week is essential to accurately projecting players and building good lineups. It’s not impossible for field WRs to have productive days, but it is statistically far less likely than for their boundary WR counterparts. Your cash lineups and highest exposure players in GPPs should be primarily sourced from field WRs or inside SBs on the field side to maximize targets and thus, scoring potential. Field WRs should be more of your 5-10% exposure players in GPP in the hopes of occasionally riding the good variance wave to victory. As always, feel free to find me – @benyamen – or @RealestChrisKay on twitter with your thoughts and questions or join in the conversation in the Forum. Hopefully you still had a solid week 1 of the season with the large contests available and this information is just another bit to push you over the cash line in week 2. FO BICTORY!